Creating a full-time business from your blog isn’t just about creating great content. It’s about providing value to your visitors and your followers on social media too. But what if you only post once, twice, or even three times a week? Is sharing your posts a few times a week on Facebook, Twitter and Pinterest enough to gain traction, establish Authority and be as helpful as possible to those who follow what you do? I don’t think it is. I think many bloggers are missing opportunities on their social channels because they aren’t sharing enough. How do you share content when you only have X number of blog posts to choose from? You search for, and share, content from other people that is relevant and complementary to your own. Not only is spreading knowledge and opinions from other people what the Internet is for, it’s also a great way to connect with others in your field. There’s an interesting article by Hossein Derakhshan called The Web We Have to Save that I recommend you take the time to read. Not only is this a fascinating story about how one man went to prison for the things he wrote on his blog (partially), but also how he observed the changes on the Internet after not having been online in 6 six years. These few paragraphs of his article struck me. If that isn’t enough to show you the power that social networks and their content have in reaching more people, I don’t know what is. The point I’m making is that blogging alone just isn’t enough in today’s Internet. 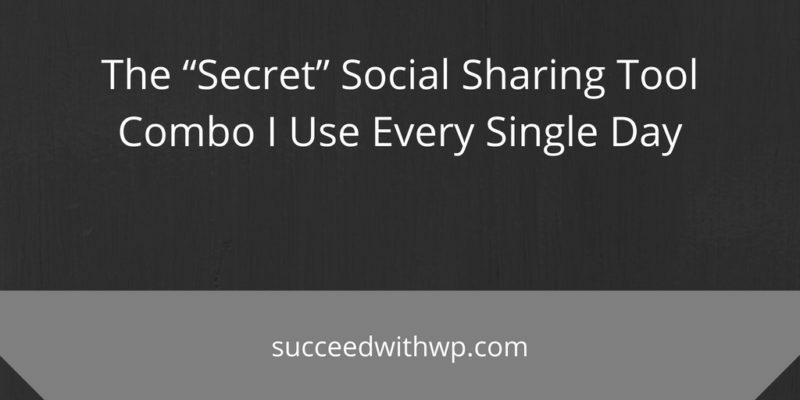 You must be sharing on your social channels too, but it’s tough if you just can’t create a new blog post every day. Who can do that? Really? In order to supplement your own blogging, I’ve been sharing other blog posts, images and videos from sources that I think are relevant to my own. There are so many sources for finding content, it would be silly to try and list them all. However, these are my top sources that I use daily. And finally, blog subscriptions. Lots of them. But not by email. I use their RSS feeds. See the organizing section below to learn how I keep track. And the list goes on and on. If you’re looking for even more unique sources, check out this blog post by the team at Buffer. As I said above, I follow blogs using their RSS feeds. Over 500 of them. How the hell do I keep track of over 500 blogs daily and keep them organized? One word. Feedly. It’s free and you should go there now. Feedly lets you simply enter a website address and it will automatically pick up the RSS feed and start listing the blog posts from that site. You can find new sites to follow using search, tags, or from the automated recommendations. You can also organize the sites you follow by creating categories and assigning sites appropriately. A snapshot of my Feedly dashboard. You can use Feedly on your desktop or through their mobile apps. There is no other RSS reader that works as well as Feedly. You’ve heard of Buffer right? That’s the second tool in my arsenal. I had the pleasure of meeting one the Co-founders at a conference a few years ago and after hearing him talk at length about how Buffer was a “different take on social sharing and scheduling”, I signed up and haven’t looked back. Buffer allows you to share content easily through the use of browser extensions and their mobile apps. They also allow you to create predetermined sharing schedules for any social account you have connected. As an example, I have 13 different social accounts connected in my Buffer account. Several for Facebook, Twitter, Google Plus, and even LinkedIn. I even have these accounts “grouped” into Personal and Business so I can choose exactly what accounts when I decide to share something. So you can manage, discover and organize the sites you follow in Feedly. You can easily share, schedule and organize your various social channels in Buffer. Guess what? 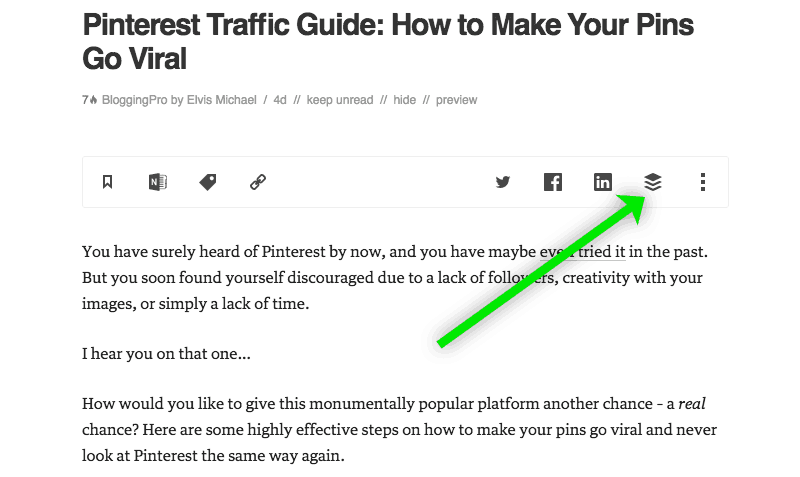 Feedly includes a Buffer sharing button in addition to the other social channels they include. Here’s a screenshot of a blog post I’ve opened in Feedly and the handy little Buffer button. Buffer share icon in Feedly. After clicking that button, all of my available Buffer accounts and groups display allowing me to easily edit my shared text, hashtags and more before I click Add to Queue, Share Now, Share Next or Schedule. If you find yourself drowning in the endless sea of information and struggling to keep your social content calendar organized, consider the Feedly + Buffer combo. What are your favorite social tools? Let me know in the comments. If you’ve found this article useful, please consider becoming a free member of this site. Signup here for access to my forums and private Facebook group. If you’d rather just get my newsletter without access to the forums and Facebook group, please subscribe below. Great post 🙂 I’d been using Huitsuite and I assume buffer is a competitor? I think Hootsuite is still valuable, I use it myself for keeping track of conversations and replying to people but there is some overlap of features (like scheduling). PS: I finished up that green screen segment on my YouTube video. Looks great Lori, nicely done! Great post! Feedly and buffer are amazing tools. 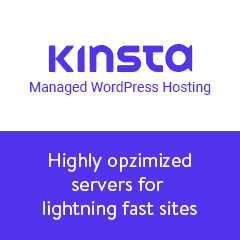 I also use revive old post in wordpress and Coschedule. Both awesome tools to keep my social media always going strong. BTW. what is the popup that asks people to share? What plugin is that? Funny you should mention Revive Old Post. I’m just about to employ that one here and blog about the process and the results. CoSchedule is awesome too, I agree! I am very happy that your shared these tips. I especially like the combo of Feedly and Buffer. I will bookmarked this post.